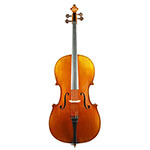 These instruments are made of high quality tonewood only. Graduated and finished by hand, these instruments have reached a very high reputation among many student instruments on the market. Set up with fine ebony fittings, these instruments are easy to play, well balanced and of very good tonal quality. Not only for beginners! 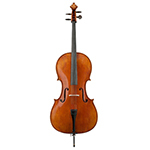 Our master instruments are carefully handmade to perfection. 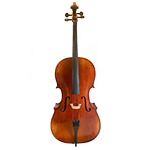 Every model is closely related to the Stradivarius patterns, other models can be made upon request. 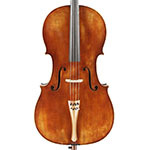 We select only the finest materials available – the wood of our master instruments is aged at least 6 – 8 years. All instruments are individually varnished, fitted and set up. Usually these fine instruments are "old imitated". 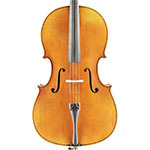 Each cello has its very own appearance and is a unique piece of art. 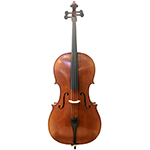 We always carry a wide variety of white, varnished and set up instruments in stock. 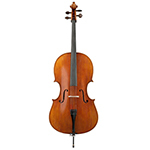 All concert instruments are made in the same Strad related pattern as our master instruments. The tonewood is aged for many years and selected in our workshop. Each instrument is graduated by hand and individually spirit varnished. The set up is made upon request by our violin makers when the final quality control is done. These instruments will satisfy any expectation. The ambitioned amateur as well as the advanced student appreciate the rich and warm tone of these outstanding instruments. Excellent Master Cello, made of very nicely flamed maple and a high quality mountain spruce top. We only use the finest materials for these graceful cellos. Each instrument is graduated and finished by hand to reach the best tonal results and craftsmans’ standards. 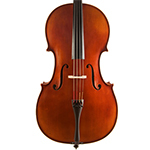 We only use spirit varnish to give our instruments the well known and highly appreciated beautiful appearance. 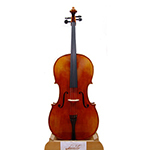 These fine cellos are of course varnished by hand, individually "antiqued" and set up with fine Italian or French fittings.